UTAX smart works together with our appliance to make light work of any task. The hardware platform is simply and securely integrated into the customer network and automatically collects all of the available data from your connected systems. It only takes a few minutes for you to access a complete overview of all printing and multifunctional systems registered in your network. The advantage is that no software installation and setup is required on the customer server and there is no need to modify the system landscape! UTAX smart technology guarantees data protection at all times. All data is encrypted using TLS when it is transferred. Companies can therefore transfer all of the data relevant to maintenance to their retailer too. 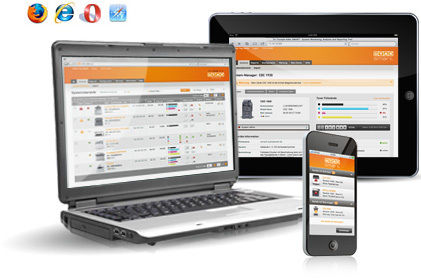 UTAX smart is a software for the web browser. Without further software installation or licensing our solution is available anytime and anywhere via login. 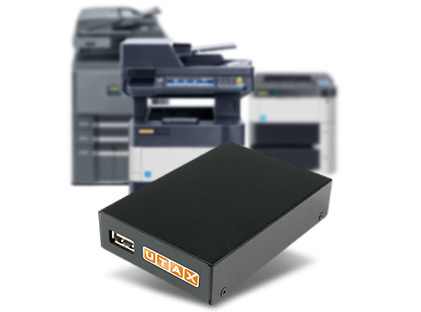 UTAX smart is can also be used platform-independently, whether on PC or Mac, Linux or mobile equipment such as smartphones (iPhone, Android, Blackberry), iPad or tablet PCs.